After the fall of the Western Roman Empire in the end of 5th century, the western and central part of Europe was swept down by many barbarian tribes and fall into so called Dark Ages for some five centuries. During this time, the centers of world's art and science moved to the east—to the eastern Roman Empire, which managed to survive the attacks, China and India, where great civilizations grew and spread, and into the mighty Arabic empire. The period 9th-13th century was a full of extraordinary activity in science and technology in the Arabic empire. In 8th century the Abbasid dynasty took over rule of the vast Muslim world and moved the capital to the newly-founded city of Baghdad. Over the next five centuries, the city would become the world's center of education and culture. The Abbasid Caliphs were very interested in clocks and ingenious devices. There are many recorded contributions to the area of automatic machines from this period. 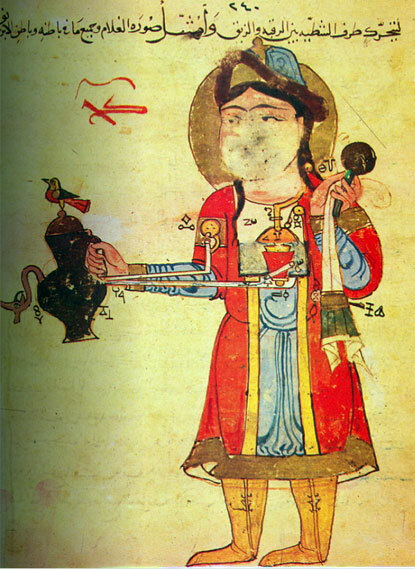 The arabic automata technology, as well as many other arabic technologies, had as a basis the greek automata tradition of mainly two engineers, namely Philon of Byzantion and Heron of Alexandria. 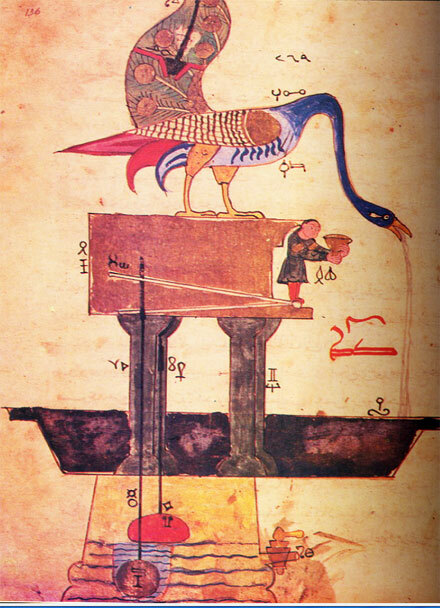 Several Arabic scientists are known to had been worked in the field of automata, e.g. Abu Musa Jabir ibn Hayyan from 8th century, the so called pseudo-Archimedes and Banu Musa brothers (3 Persian scholars from Baghdad) from 9th century, Al-Muradi and Al-Khazini from 11th century, Hibat Allah ibn al-Husayn and Ridwan Al-Khurasami from 12th century, but the most important work in this field is al-Jamiʿ bayn al-ʿilm wa ʿamal, al-nafiʿ fi sinaʿat al-hiyal (The book of knowledge of ingenious mechanical devices) of Al-Jazari from 1206. Al-Jazari (his full name is Al-Shaykh Ra'is al-A'mal Badi' al-Zaman Abu al-'Izz ibn Isma'il ibn al-Razzaz al-Jazari) was an influential scholar and engineer, who lived in the second half of 12th and in the beginning of 13th century. He died in the beginning of 1206, just few months after he had completed his famous book in January, 1206. Al-Jazari was in service at the court of three Artuqid rulers since 1174 until his death, and the above-mentioned book was created in the period 1198-1206 in response to the request of Nasir al-Din Mahmud (1200-1222). According to his name, Al-Jazari was born in Al-Jazira (the traditional Arabic name for what was northern Mesopotamia and what is now northwestern Iraq and northeastern Syria, between the Tigris and the Euphrates). Like his father and his brother before him, he served as an engineer at the Artuklu Palace, the residence of the Diyarbakır branch of the Turkish Artuqid dynasty, which ruled across eastern Anatolia as vassals of the Zangid rulers of Mosul. The earliest copy of the book, survived until now (from 1206) is a fine manuscript with excellent illustrations. Each device is described in a simple and easy to understand Arabic, and each is accompanied by a general drawing. For the complicated devices the author gave detailed drawings for the components of the device or for subassemblies so that the operation can be understood. There are a total of 174 drawings in the book. Al-Jazari also invented water wheels with cams on their axle used to operate automata. The humanoid automata of a girl that could serve water, tea or drinks, shown in the upper image, is very interesting. The drink was stored in a tank with a reservoir from where the drink drips into a bucket and, after seven minutes, into a cup, after which the waitress appears out of an automatic door serving the drink. 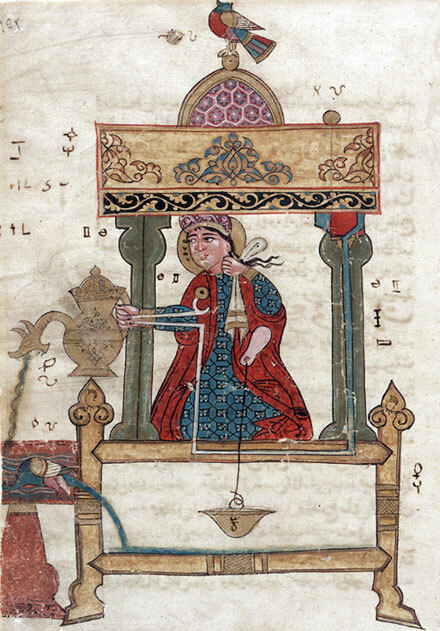 Al-Jazari described a hand washing automaton (see the image below), incorporating a flush mechanism, now used in modern flush toilets. It features a girl automaton standing by a basin filled with water. When the user pulls the lever, the water drains and the girl refills the basin. Al-Jazari's peacock fountain was a more sophisticated hand washing device, featuring humanoid automata as servants which offer soap and towels. Pulling a plug on the peacock's tail releases water out of the beak, and as the dirty water from the basin fills the hollow base a float rises and actuates a linkage, which makes a servant figure appear from behind a door under the peacock and offer soap. When more water is used, a second float at a higher level trips and causes the appearance of a second servant figure, this time with a towel! 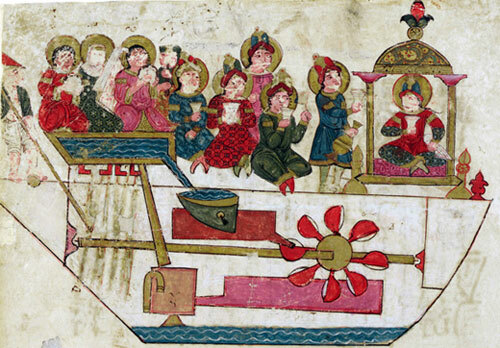 Al-Jazari described also a musical automaton (see the image below), which was a boat with four automatic musicians (a harpist, a flautist and two drummers), that floated on a lake to entertain guests at royal drinking parties. The mechanism featured a programmable drum machine with pegs (cams), that bump into little levers that operated the percussion. The drummer could be made to play different rhythms and different drum patterns if the pegs were moved around. The automata were a robot band, which performed more than fifty facial and body actions during each musical selection.